Leather furniture is among the most stylish, cool and elegant of all furnishing that you can pit up in your interiors and the best part is that it goes well with both the modern look and even the laid back retro style. Leather furniture is sought after both for the class it exudes, for the simplicity of its look and the grandeur it brings to the room. Leather furnishings are more about subtle grace rather than a look that shouts out and begs to be noticed. Just get a leather couch and add it to your home to notice the difference it brings both in the feel of the space and the look of your guests. Neighbor’s envy, Owner’s Pride- that pretty much sums up leather furniture. But how do you take care of your precious leather darling? Well, it’s easier than what most people make it out to be and here is a straight forward guide that will help you preserve the beauty of your leather furniture. Here’s how to take care of leather furniture. One of the most basic steps in keeping that shine on your leather furnishings for a long time is to keep them clean. This does not mean you tidy up every time a party is around the corner. You need to take weekly care of your leather furniture. Most often a dry cloth and vacuuming will be sufficient in this regard. If you ever spill something on it though, make sure you clean up quickly and aptly. The most common mistake that people make is using excessive water and soap to clean their leather furniture. This is an absolute no-no as it disintegrates the surface and speeds up the cracking and breaking process. Do not use strong solvents and stuff like ammonia on it as they could bleach the leather. Even when there is a stain, use the minimum water required for cleaning up and do not allow the water to remain stagnant on the surface. Some gullible people are duped to believe that suing a conditioner often will keep their leather furniture shining like the sun- forever! You could not be more far off from truth. Use the conditioner judiciously and once every 6-12 months. There is no need to put it on and polish your leather once each month. Most commercial conditioners are too strong, so make sure you pick something mild. You can always make one at home as well. Remember that leather was once the skin of an animal and just like too much sun and heat are no good for your skin, they are not all that welcome for leather as well. If your leather sofa set sits close to a sunny window, the use a window treatment. Keep your leather furniture away from the fire place and at a spot that is cooler. This one comes both from personal experience and common observation. 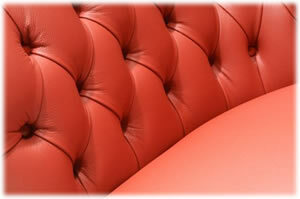 Take special care of your favorite spot on the leather couch as it will be the first to show signs of wear and tear. Since you will excessively sue it for reading your newspaper, watching TV and playing your Xbox, it will automatically require extra attention. Switching spots once in a while is cool, but even if you do not wish to, the make sure that the ‘hot spot’ is pampered enough. Whenever you buy leather furniture, make sure you ask the seller about the details of the leather and the suggested ways of keeping it new as long as you can. This will be the best piece of advice you will ever get as leather varies with its place of origin and only by knowing its exact variety can you actually take the right care. Unlike most other furnishing, leather indeed demands a tad bit of extra care and obviously fair distance from flaming heat and sharp edges. But if you can take enough care that is necessary, it will manifold to the beauty of your home!